WooCommerce currently powers 28% of all e-commerce websites (according to WooCommerce), making it one of the leading e-commerce software providers. To help your kick start popup strategy we gathered 4 campaigns from top WooCommerce stores and dissected what made them so good. Targeting: displayed to new visitors on landing, this simple email popup allows the website to catch new visitors before they get a chance to leave. It also helps convert new visitors into shoppers. Copy: the headline is very catchy and highlights a clear benefit for new subscribers. Design: both the overlay and the popup match the website color and graphic identity: the popup doesn’t breach user navigation. The call-to-action is very visible. Copy: the headline is simple and straightforward. Design: again this exit popup matches the website’s identity perfectly. Dimming the background allows the user to focus on the popup. Trigger: displayed to all visitors on landing, the popup reaches the largest possible audience. Copy: the headline is clear and appealing. The note below the call-to-action contributes to reassure the user. Design: the big photo helps the users picture the prize. The overall design is simple and focuses the attention on the headline. 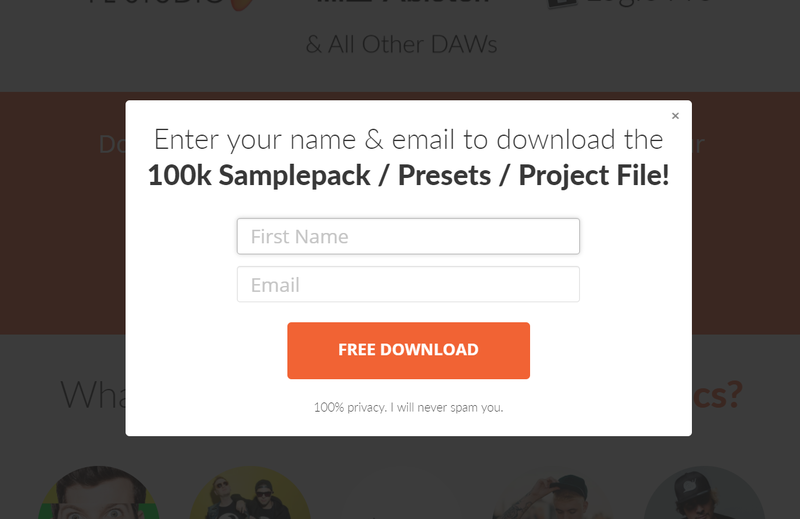 Trigger: the popup appears when the user clicks a call-to-action to download a freebie. Copy: The headline clearly reminds the user of the freebie. The call-to-action also insists on the download rather than the sign-up. The privacy notice helps to sweep the last objections aside. Design: The design is very simple and matches the website’s visual identity. Trigger: the call-to-action appears as soon as the user lands on the website. The popup itself is displayed only when the visitors click the call-to-action. Design: The mail icon is very simple and non-intrusive. Yet, its bright colors make it highly visible. Trigger: the popup is displayed when the visitor opens the homepage. Copy: the popup features a catchy headline followed by a short message. Simple and efficient! Design: The two-columns design allowed Femme & Fierce’s team to add an attractive visual taken from their new collection. The popup could be even better with a clear call-to-action. WisePops is the most advanced WooCommerce popup plugin. We work with leading e-commerce websites such as Asics, Ocado, Exito, Fender, Skechers and hundreds of WooCommerce stores.